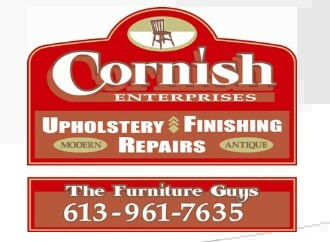 Cornish Furniture Restoration supplies the area with quality furniture refinishing, reupholstery, caning, repairs and touch-ups. fabric samples. We are experienced with period pieces as well as modern. We can also take your old chairs and couches and give them a new life by restyling them. Cornish Furniture Restoration offers “one-stop shopping”, free estimates, flexible hours to meet your needs, workmanship guarantee, and 7-10 day turnaround time. You can save even more on our low prices by supplying your own fabric and by doing your own delivery and pick-up. We are very proud of the quality of our workmanship, and our honest, straightforward attitude with our customers . We will tell you directly if your piece is not worth refinishing or reupholstering, and give other possible solutions. Whether it’s a Residential, Commercial or Insurance job, come on in to discuss your needs, you’ve got nothing to lose. Please call or email us today for a free estimate or to ask a question.